How to edit the audio track of your home video? It often happens that the audio track of your home video lacks quality: the voices are too loud or too quiet, there are unwanted noises present etc. Improving the quality of the audio track will certainly enhance the overall quality of your home video and make it more pleasant to watch and show to your family and friends. 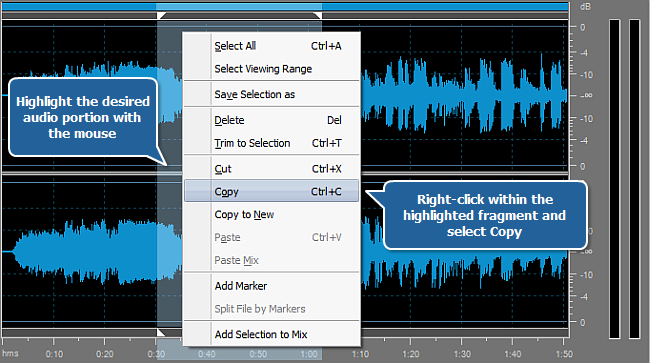 Improving audio quality is easy with AVS Audio Editor. This program will allow you to open a video file, edit its audio track and save the result as a video file with the new, modified audio track. Follow these simple guidelines below to edit the audio track of your video. Note: see the Write section of the Supported Video Formats table to check the list of compatible video formats. 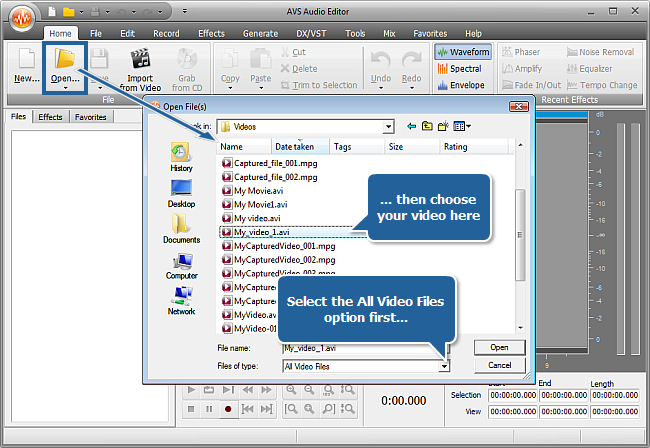 Click the Open button in the Open File(s) window - the selected video file will be imported into AVS Audio Editor. The video will be displayed at the bottom of the Files section. The audio track will be visualized in the Waveform Display area. Now you can start editing the audio track of your video. You can apply various audio effects to edit it. 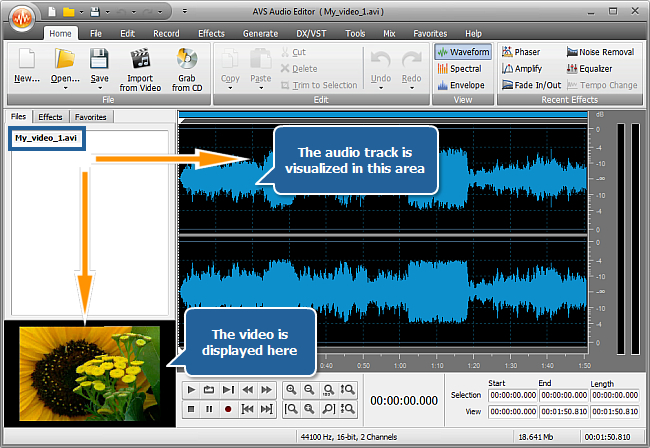 Read this guide to learn how to apply effects using AVS Audio Editor. Note: the audio effects that change the audio track duration are greyed out. Use Mute to mute some unwanted part of your audio track. 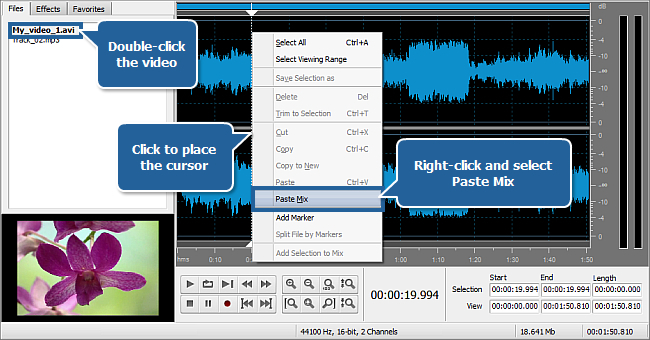 Use paste operations to replace the original audio of your video file with (a part of) another audio track. Note: the paste operations that change the audio track duration are greyed out. in the opened window set the original/pasted audio volume relation and click OK. Set Amplify Paste to 100% and Amplify Selection to 0% to mute the original sound completely. The audio portion copied from the audio file will be pasted in the current cursor position and overwrite the original sound of your video. 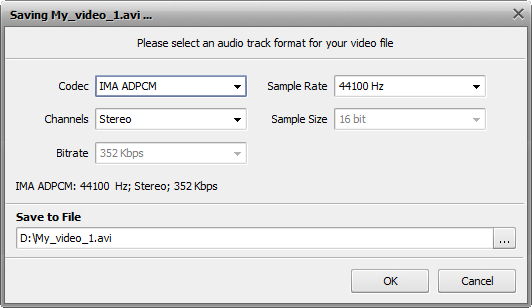 Configure the audio track parameters of your video file. Next select the location for the resulting video file and press OK. Wait a few moments while the program saves your file. That's about all. You can now watch the video and enjoy its audio track quality.